Bose debuts world's first audio augmented reality (AR) wearable 'Frames'. Bose today announced Frames, a breakthrough product combining the protection and style of premium sunglasses, the functionality and performance of wireless headphones - into one revolutionary wearable. Frames take micro-acoustics and voice control to an entirely new level, debuting the future of mobile sound in the tiniest, thinnest, most lightweight Bose system ever. With a proprietary open-ear design, Frames can stream music and information, take and make calls, and access virtual assistants - while keeping playlists, entertainment, and conversations private. Bose Frames come in two timeless styles - square and angled, or round and slightly smaller. 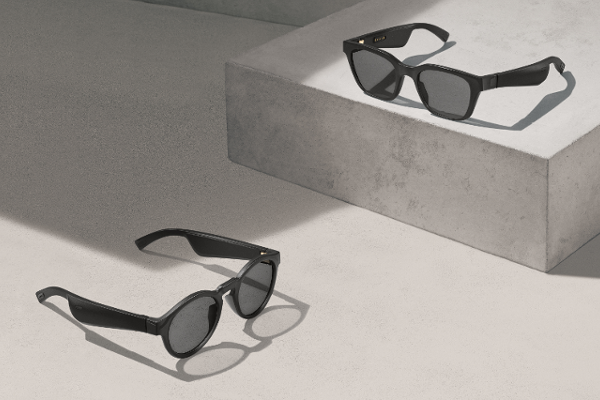 Both block up to 99% of UVA/UVB rays, and feature uniformly tinted lenses and distinct accents - including gold-plated steel hinges and charging pins. They're scratch and shatter resistant, and weigh a mere 45 grams - standard for the category. Bose Frames function like truly wireless headphones. A miniscule, wafer-thin acoustic package is set seamlessly in each arm's interior - rather than an earbud, or attached component - to produce discreet sound for the user. For touch and voice control, an ultra-small microphone and multi-function button are embedded on the right temple for power and pairing, Siri and Google Assistant, calls and commands, or to pause and skip songs. The Bose Connect app provides additional features now, and software updates for new features in the future - like Bose AR. Bose Frames are Bose AR compatible - the first commercial product embedded with the Bose audio augmented reality platform. Unlike other augmented reality glasses and platforms, Bose AR doesn't change what you see, or use a lens or phone camera to superimpose objects in your sightline. Instead, it knows where you are and what you're facing using a 9-axis head motion sensor and the GPS from your iOS or Android device - and automatically adds a layer of audio, connecting that place and time to endless possibilities for travel, learning, entertainment, gaming, and more. It's all accessible through the ease of listening - clear-eyed, heads-up, hands-free. And with Bose AR experiences in development, it's coming soon to Bose Frames. Bose Frames use a lithium battery that connects to an included pogo-pin cable for charging. At average listening levels, they run up to 3.5 hours for playback and up to 12 hours on standby, and can be fully recharged in less than two hours. For smudges and storage, they come with a cleaning cloth/bag and protective case. Bose Frames are available in January 2019 for $199, preorders start today, and Bose AR apps are coming next year. Bose Frames come in Matte Black and two universal styles - the larger (Alto) and smaller (Rondo). Both are available in the U.S. beginning in January 2019 at Bose stores and Bose.com at launch, followed by select resellers; and global markets in Spring 2019. An update on Bose AR, the industry's first audio augmented reality platform, will be shared at SXSW 2019.